Towering flames shot out of a multi-unit building in San Francisco's North Beach neighborhood Saturday night, pumping thick, black smoke into the air visible from miles away. 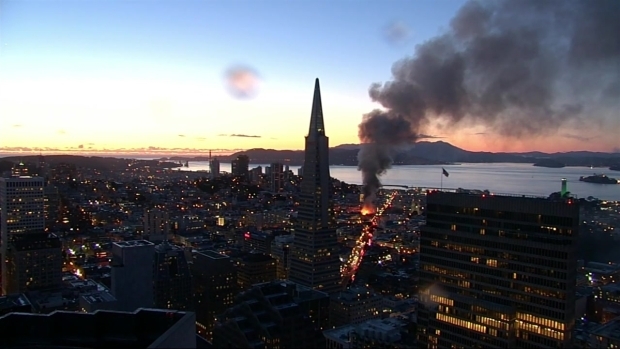 Despite the chaotic scene on the night of St. Patrick's Day festivities in the city by the bay, no civilians were hurt after the four-alarm blaze erupted at 659 Union St., fire officials said. One firefighter still on the scene Sunday morning was injured after falling off a firetruck, but he is said to be stable. "You can feel the heat," witness Alex Sejic said as crews fought the inferno. "We were just here standing across the street. You can feel the heat on your face. It was really bad." On Sunday afternoon, the Department of Building Inspection said the fire caused structural damage rendering the building unsafe and uninhabitable, and the building has been red-tagged. The building contains five commercial units on the ground level with vacant residences above. As of Sunday morning, eight people from a nearby building were still displaced as a result of the fire, according to fire officials and the Associated Press. 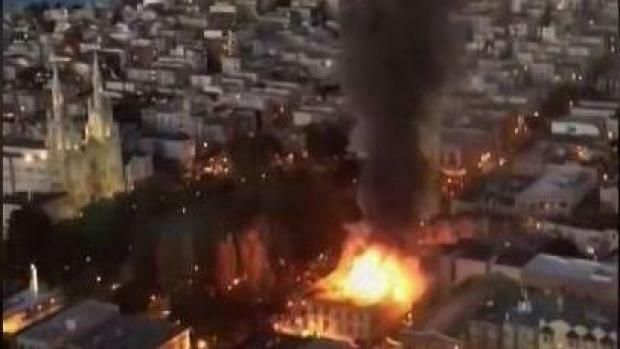 Fire crews arrived at the site of the blaze within two minutes and started dousing the flames within six minutes, San Francisco Fire Department Chief Joanne Hayes-White said. After implementing a four-alarm response, fire officials declared the blaze under control at 1:11 a.m. on Sunday. "The fire got pretty big pretty fast," witness Nathan Lederer said. "It took them awhile to get it out, of course." As crews attacked the fire, roaring flames lit up the pre-night sky. Black smoke billowing into the air was photographed from as far away as the East Bay. "Eyes are burning and air is hard to breathe," Jenn Davis wrote on Twitter as she captured footage of the blaze. A half-dozen businesses remained closed Sunday as firefighters investigated the fire. Shadi Zaghayar, who runs Coit Liquors, said it closed for six months after a fire in the building in 2014. It’s been a family business for 10 years. "Four years ago, I dealt with the same situation," said Zaghayar, who plans to reopen again. "We just need support for the neighborhood; this is a great neighborhood. What makes me stand on my feet is these people who live here." Salvatore Cantara, owner of Michaelangelo Café, said his establishment was packed when customers evacuated. Food was still on the table Sunday. Cantara is worried about the future. "Smells likes smoke," he said, fighting back tears. "There is water on the ceiling. Twelve years, three jobs to open this business." San Francisco Supervisor Aaron Peskin, who was having dinner nearby and was at the scene of the fire within minutes of it starting, said the fire department was slow in its response. He then called for Hayes-White's resignation. "It starts at the top," Peskin said. "I called her during this event repeatedly. Her voicemail is full. But even her high-ranking staff that got here realized that they were not on the job. There is no excuse for it, not whatsoever." Hayes-White said that firefighters put water on the flames from inside the building first before pulling out and battling the inferno from the outside. Interim Mayor Mark Farrell and San Francisco Board of Supervisors President London Breed stood behind the efforts of the fire department and the chief. "Any talk like that during a time like this I think is inappropriate," Farrell said while speaking at the scene. Breed stated that the most important thing to consider at the time was the fact there were no injuries and that firefighters were still trying to fully gain control of the blaze. Peskin plans to launch an investigation into the fire department's response, but a specific timetable was not immediately known. "This has nothing to do with politics," he said. "This has to do with an abject failure by the fire department." An investigation into the cause and origin of the North Beach blaze is still under investigation. NBC Bay Area's Christie Smith contributed to this report.